Chuck was down with the LGI group and Doug on their annual hunt and he had harvested a Red Stag last year so we had talked about a couple options one being Scimitar Horned Oryx one being Iranian Red Sheep. We decided to run by the other ranch and just look at some sheep everyone said Chuck likes him some Sheep. We made our way over and looked at some sheep. Once this giant showed himself there was no doubt the hunt was on. The sheep where feeding across an opening and this one knew where to stand and position himself with smaller Iranian Red Sheep either in front or behind him so we could not shoot. As they turned and where about to run he cleared for a fraction of a second and ol’ Chuck let him have it. One shot and this great Iranian Red Sheep was down for the count. It was a quick hunt but as we made our way to the Iranian Red Sheep we knew we had one for the books. Once we got him skinned and ready to go in the freezer I measured him and he is #7 all time in the Trophy Game Records Of the world. 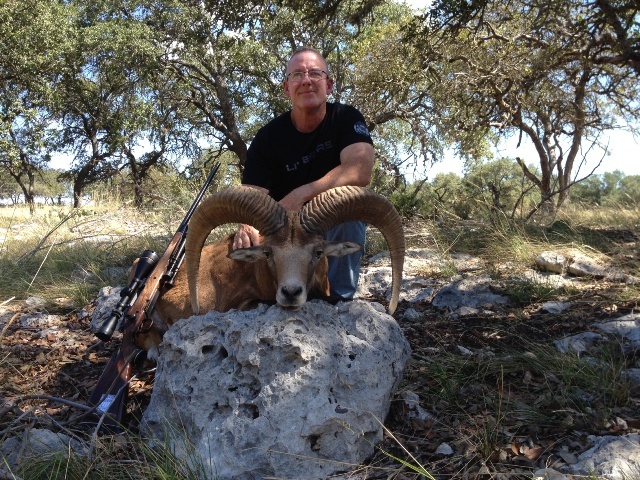 Congrats Chuck on a great Trophy Iranian Red Sheep.